Antique Chocolaterie Switching JSK + KC in Green - Domestic Shipping Included! Like New!! Domestic Shipping included on this beautiful fully back shirred set ! Angelic Pretty's Antique Chocolaterie in the gorgeous emerald green colorway with matching headbow! 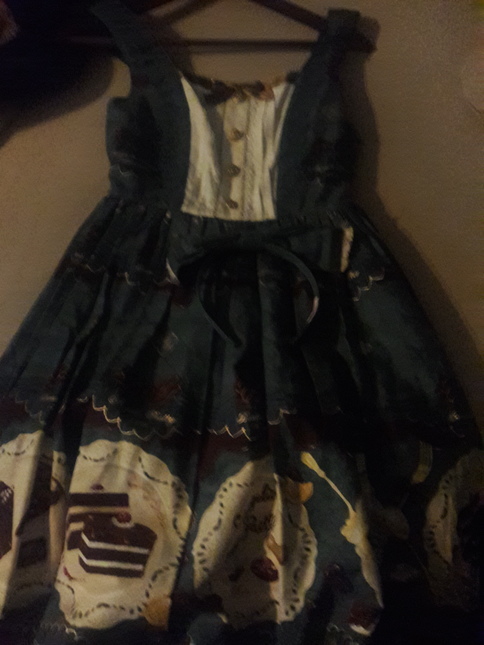 I have only.worn the dress once, and there are no issues with it. The dress has full back shirring, so it should accommodate quite the variety of sizes. I fit into it easily at 100 cm bust and 82 cm waist. DOMESTIC SHIPPING: Included in bin price.